My best friend, Lindsay, and I recently returned to Tapas on Main. We had an idea of what we wanted to order going in, but to our surprise, they had changed the menu. They now have their fall menu out so while we were disappointed that we couldn’t order our favorite salad from there, we were excited to try some new things. 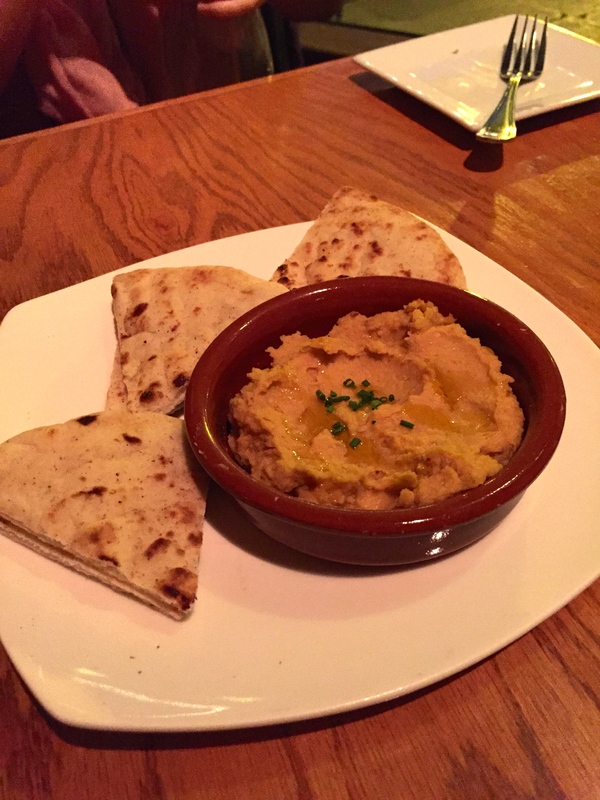 We started off with chipotle hummus served with toasted pita. Although the hummus wasn’t as spicy as we had hoped for, it was still tasty and the pita bread was perfectly warm and soft. Even though they changed the menu, they still have some of the same items on the menu. We were very excited that the Croquetas de Setas, which are portobello and leek croquettes with roasted jalapeño and tomato aioli, were still available. If I had to tell somebody to try one thing at Tapas, it would be these croquetas. They melt in your mouth when you bite into them, and the aioli is the perfect level of spice. Lindsay and I joke every time that we want to get a bottle of the aioli to take home with us. 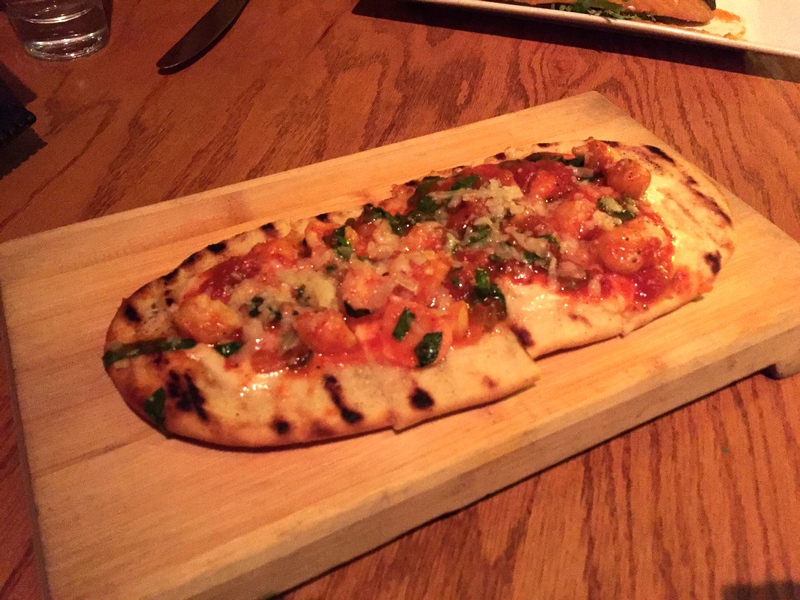 We’ve never had a flatbread while there so we figured we would try the Coca de Camarones – a flatbread with shrimp, spinach, aged Manchego cheese, and garlic olive oil. The shrimp and cheese didn’t have as prominent of flavors as I hoped for. Lindsay thought the sauce tasted funny, but I thought it tasted like a typical Margarita pizza. I enjoyed it, but hoped it would have a more distinct flavor to it. 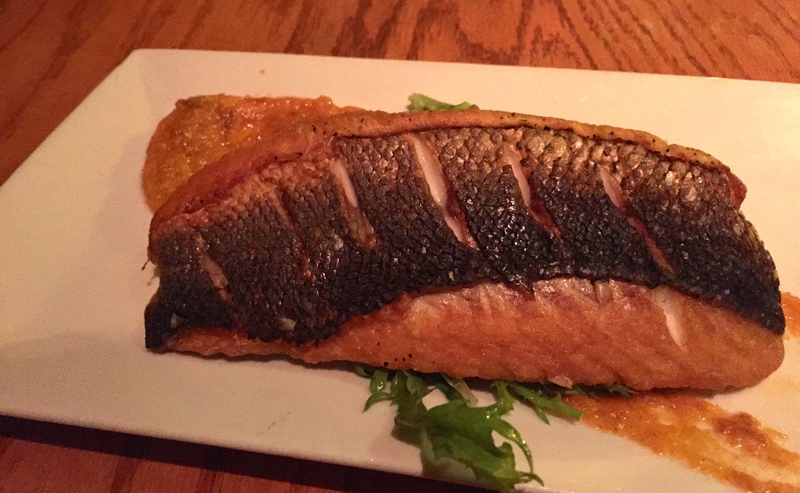 Lindsay suggested we try the Branzino al Sarten. It was seared Mediterranean Sea Bass with a sweet potato puree, and a roasted tomato frisee salad with a balsamic glaze. I’m not the biggest fish eater and I have to be in the mood for it, so I wasn’t overly excited about this dish. Besides the croquetas, this was my favorite thing we ordered. The sweet potato puree gave it such an amazing flavor. Sea bass is typically a blander tasting fish, so the puree really helped to make the dish. The salad on the side was tasty as well, although there wasn’t much of it. This was my first time dinning inside of the restaurant, and it has such a quaint, charming, and warm feel to it. You feel as though you’re in an intimate Spanish setting while there. The service was good, and overall it was an enjoyable evening.